Camasey peludo is a very little known small fruit from Central America. 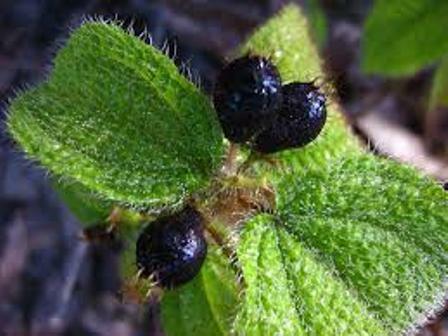 Botanists believe it to be endemic to Puerto Rico where it grows mainly in the Luquillo Mountains, the Cordillera Central and moist foothills in the eastern, northern and western district from sea level to 1000 m.
Camasey peludo bears small berries which taste like blueberry with a strong flavour of banana. The berries are very tasty and are fondly eaten by local people and the birds. This fruit is known much outside its area of occurrence, but it deserves promotion and its cultivation should be encouraged. 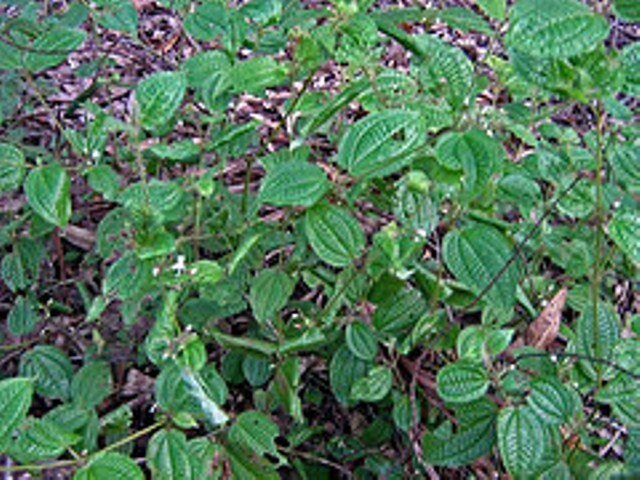 A medium to large shrub to 4.5 m in height and 7.5 cm in trunk diameter; stems may be single or multiple; bark thin, gray-brown, and smooth or slightly fissured; branches relatively few; twigs red or orange near the tips due to a thick covering of reddish hairs, greenish below, becoming brown as they grow older. 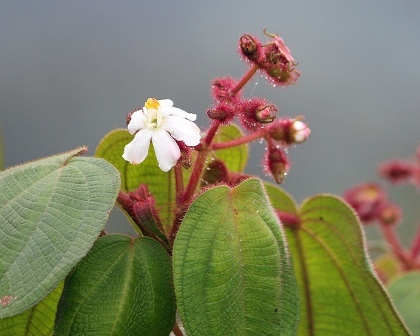 Leaves bright red or orange when young, turning green at maturity; ovate with a cordate base and an elongated tip, seven veins radiating from the base; petioles are 4 to 9 cm long and the blades are 8 to 18 cm long and 7 to 12 cm broad. Flowers white or pinkish, grouped in terminal panicles, 1.9-cm wide. Fruit a purple berry, 12 mm in diameter; juicy with a delightful blueberry like flavor. Seeds numerous, light brown, tiny, over a hundred. Camasey peludo is an attractive multipurpose plant. Its cultivation should be encouraged as an ornamental plant where ever possible. Thought it is possible to raise new plants from seed, but the most convenient way is to collect young plants formed by natural layering. The seeds, however germinate in 11 to 49 days after sowing. Camasey peludo is, however, not a very long lived plant. The plants die after 5-6 years and have to be replaced. The fruits are edible and have a very good taste. These are therefore eaten. As camasey peludo is an attractive plant, so it can also be planted in gardens as an ornamental plant. The fruits will come as a bonus. Domestication of camasey peludo for its fruits should be encouraged.